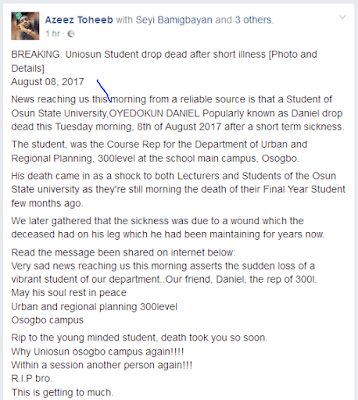 News reaching us this morning from a reliable source is that a Student of Osun State University,OYEDOKUN DANIEL Popularly known as Daniel dropped dead this Tuesday morning, 8th of August 2017 after a short term sickness. The student, was the Course Rep for the Department of Urban and Regional Planning, 300level at the school main campus, Osogbo. 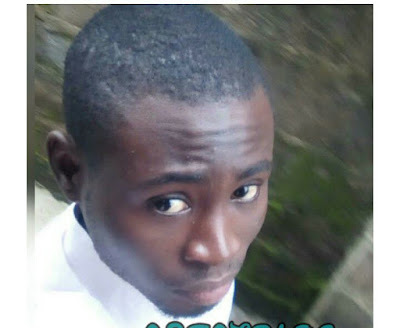 His death came in as a shock to both Lecturers and Students of the Osun State university as they’re still morning the death of their Final Year Student few months ago. We later gathered that the sickness was due to a wound which the deceased had on his leg which he had been maintaining for years now. Very sad news reaching us this morning asserts the sudden loss of a vibrant student of our department..Our friend, Daniel, the rep of 300l. Rip to the young minded student, death took you so soon. Why Uniosun osogbo campus again!!!! Within a session another person again!! !